We are currently accepting applications for the following clinics…. Our High School clinic is intended for High School and Prep School level players with strong skating and puck skills. The curriculum will provide instruction on advanced skating, puck control and passing skills. The focus of this clinic, however, will be on improving the players’ vision and understanding of game concepts. This division will skate on Sunday afternoons at the Family Ice Center in Falmouth beginning April 28 and will skate for seven consectutive weeks. This clinic is not intended for beginners. We are offering two girls only clinics this spring catering to differenct skill levels and competitive desires. The first is our "Girls" clinic intended for less experienced players who are looking to improve their core hockey skills. This division is for girls who are competing at the middle school and high school level and is also open to adult women. The curriculum will focus on skating skills with some exposure to puck control and passing skills. The pace of practice will be fast, however the tone will be slightly less intimidating. The second is our "Select Girls" clinic intended for more competitive female hockey players ages 11 to 15. The curriculum will include some power skating skills with more imphasis on agility skating, puck control and passing and an introduction to "Game Skills". Both clinics skate on Sunday mornings beginning April 28 and will skate for seven consectutive weeks. 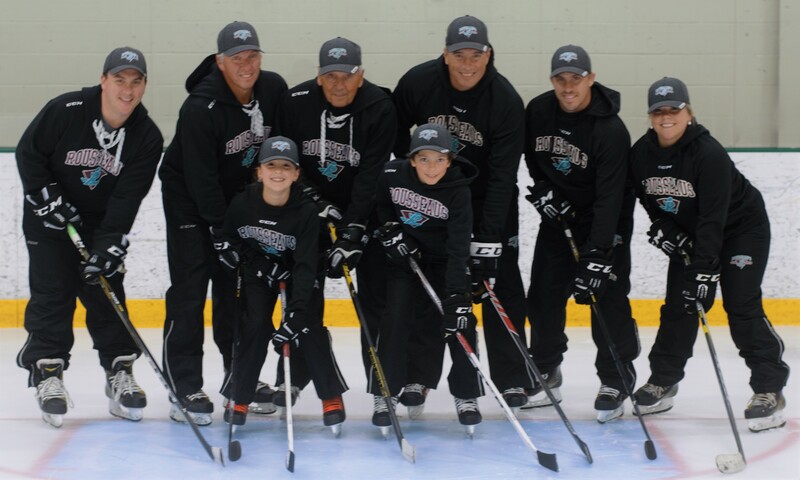 Our Adult Men's Puck Skills clinics are intended for beginner to novice level adult players and is designed for players looking to improve their overall hockey skills. The curriculum will focus on proper stick handling, passing and shooting skills and will offer drills to put these skills to practice. This clinic will skate at the Family Ice Cener in Falmouth on Tuesday evenings beginning April 23 and will skate for 7 consecutive Tuesday evenings. Our Spring Youth clinics offer five divisions catering to players age 5 through 16. We are offering divisions at the Family Ice Center in Falmouth, the Norway Savings Bank Arena in Auburn, and the Maine Ice Vault in Augusta. All of our Spring Youth Clinics will skate for seven consecutive weeks beginning the week of April 21 and each division will skate for two hours each week. The first hour is a practice session where the curriculum will focus on individual skating, puck control and passing skills. The second hour is a controlled scrimmage where we will concentrate on increasing the speed of play and offering individual instruction during playing time. Our Summer Youth clinics offer three divisions catering to players age 5 through 16. We are offering divisions at the Family Ice Center in Falmouth, the Norway Savings Bank Arena in Auburn, and the Maine Ice Vault in Augusta. All of our Summer Youth Clinics will skate for seven consecutive weeks beginning the week of July 8 and each division will skate for two hours each week for seven consecutive weeks through mid-August. The first hour is a practice session where the curriculum will focus on individual skating, puck control and passing skills. The second hour is a controlled scrimmage where we will concentrate on increasing the speed of play and offering individual instruction during playing time. Our goalie clinic is designed for goalies of all ages. The ice will be divided into stations and goalies will be grouped by age and ability. Each station will be staffed by our trained instructors and shooters for each age group. The goalie clinic will skate at the Family Ice Center in Falmouth on Monday evenings begining July 8 and will skate once per week for seven consecutive weeks through August 19. Coach Scott Rousseau named MPA 2018-19 Coach of the Year. Congratulations to Coach Scott Rousseau on being named 2018-19 Maine Principals Association High School hockey Coach of the Year. Coach Rousseau recently lead Cheverus HS to their first Women's Hockey State championship. Well done Coach Rousseau. Congratulations to Sophie Rousseau, the first female player to score a hat trick at the Quebec International Pee-Wee tournament. 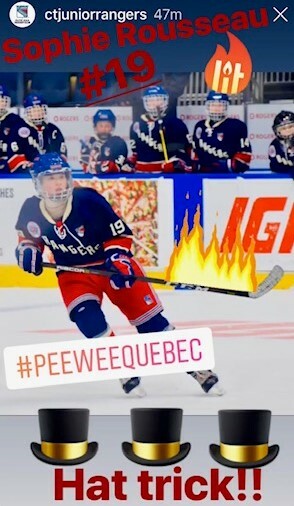 Sophie Rousseau, daugher of Shawn Rousseau recently competed with her Ct. Rangers team at the Quebec International Pee-Wee Tournament. The Quebec International Pee-Wee tournament is the largest international youth hockey tournament in the world and has been since it started in 1960. On Wednesday February 20, Sophie scored a hat trick making her the first female player to do so in the tournaments history. Well Done Sophie.... We are proud of you. Congratulations to Coach Scott Rousseau in leading the Cheverus High School girls hockey team to the 2019 Maine State High School Championship. Well Done Coach Rousseau!!! Each year we receive several testimonials from current and former students sharing their positive experience with our program and the advances that they have made in their hockey skills and enjoyment of the game. What really warms our hearts are the experiences that former students share citing the impact that our program and teachings had on their lives and how they are now passing these values on to their children. We are a family of hockey coaches and have been studying the game for 30 years. We have learned how to break down the games skills and concepts to its roots and have developed a curriculum to effectively teach them to players of all levels. Playing hockey is about having fun. It’s fun to compete, to improve, to work toward a goal and to achieve it. We hope to have the opportunity to share time with you on the ice this off-season.